My mother turned 75 this year, and we as a family wanted to bless her with a trip to the Bahamas. We arrived on June 5th to Nassau and on June 6th, my mother fell from a 3-foot ledge onto her head first and then onto her back. She could not move her arms or legs and it took an hour and a half just to get to the local hospital. She initially was not breathing, but God placed the right people/angels around her and worked miracle after miracle the entire time. 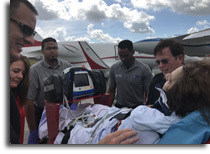 Once we were care-flighted to Miami Florida, she underwent cervical fusion on C1 and C2. 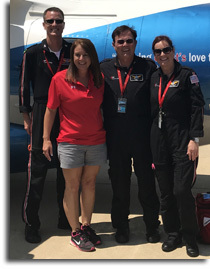 43 days at Jackson Memorial Hospital, Miami Florida and then another amazing miracle – we found out about Grace on Wings!!!!. Our family was running out of resources just to fly from Ohio to Miami to stay with my mother. She needed 24-hour care from her family to help the nursing staff with eating, drinking and helping motivate her through intensive physical therapy. Our families resources were running out and the stresses were adding up. Grace on Wings allowed my mother to be flown from Miami Florida to her hometown of Athens, Ohio to continue her therapy and to have all the resources and family close by. God answered our prayers! What a beautiful organization led by God! My mother was overwhelmed with gratitude and relief as the Grace on Wings staff came to take her home. They prayed with her and over the flight, and it was like being held by angels the entire time for her.